As the direct link between the power and torque coming from the output shaft of the transmission to the pinion yoke of the differential where it’s transferred to the axles, the wheels, and finally the tires on the pavement, the driveshaft is an incredibly vital component to the operation of a vehicle. It would be safe to say the vehicle isn’t going anywhere without one, but that’s a rather obvious statement that could be made about a lot of components. But a driveshaft takes a lot of stress, particularly in high horsepower racing applications; they must be straight, strong, and durable. And in a race car, it’s also preferable that it’s as light as possible. Dynotech produces a full lineup of driveshafts in a number of materials, including carbon fiber, carbon fiber-wrapped aluminum, chromoly steel, and D.O.M. steel. Producing a strong yet lightweight driveshaft is a task that separates the men from the boys, so to speak, in the aftermarket industry, and Dynotech Engineering has been making a name for itself in virtually every major racing organization for decades by delivering driveshafts that stand up to the task at hand. Today, we’re going to bring you a detailed look at Dynotech‘s range of steel, aluminum, carbon fiber, and even carbon fiber-wrapped aluminum driveshafts with their own Steve Raymond, discussing everything from interesting facts such as how a carbon fiber driveshaft is made to how you can best go about selecting the right driveshaft for your needs and budget. First, let’s take a look at the commonly used materials for driveshaft construction and the pros and cons of each. Steel is the most common material used for OEM driveshafts, because not only is it strong and reliable, but it’s very cost effective to manufacture. Now, you might be thinking that anything that’s cheap to make and is used on a passenger vehicle can’t be adequate for a race car, but this is a misconception that Raymond quickly put to rest. As with many race car components made from steel, the material is extremely durable, and that’s key when you’re transferring a lot of horsepower through it. Dynotech produces both mild steel (Drawn Over Mandrel) and Chromoly steel driveshafts. They offer a clear trade-off, with the Chromoly material offering the superior strength, while carrying a slightly higher – albeit virtually indistinguishable – weight. Of course, the obvious trade-off to the use of steel is weight. Not only are you carrying more physical weight on the race car, but more importantly, you have more rotating mass spinning at high RPM. This robs the car of performance — even worse when there’s less horsepower on tap. One of Dynotech’s 3.5-inch Chromoly steel driveshafts. Like their mild steel counterparts, these shafts have an .083-inch wall thickness, making them the heaviest of all driveshaft materials, but capable of handling more horsepower and more vehicle weight. Steel driveshafts can be broken down into two different sub-materials: mild steel (the aforementioned Drawn Over Mandrel), and Chromoly. There are some basic trade-offs between the two, and the weight difference between them is present but virtually indistinguishable, however, each has its own place and its own application. Chromoly, because of it’s strength properties, is the strongest material you can produce a driveshaft from, but that isn’t to say that mild steel can’t take a beating. According to Raymond, the common driveshaft thickness is .083-inch wall, so despite what we know about chassis tubing where chromoly is stronger and can therefore be thinner, driveshaft tubing is produced at a more standard thickness due to these critical manufacturing tolerances. The primary advantage of an aluminum driveshaft is its lightweight characteristic, and as Raymond pointed out to us, it’s more about the ends and less about the actual tube that derives the weight savings over a comparable steel shaft. The lighter weight material improves the initial imblance of the driveshaft and the residual imbalance can have an influence on the driveshaft critical speed, or the RPM at which the driveshaft will resonate and begin to vibrate uncontrollably. At a high speed, a long, skinny, driveshaft will begin to resonate. Because aluminum is lighter, it can be made thicker, allowing it to remain more stable without impacting performance because of increased inertia. Aluminum driveshafts not only deliver less rotating weight than a steel driveshaft, but they also improve balance — especially on long driveshafts — where a heavier shaft will tend to bend due to the initial imbalances of high RPM rotation. So while acceleration and higher speed potential are surefire bonuses, the reduced risk of damage from vibration are key pluses for an aluminum driveshaft. This brings us to the ultimate in driveshaft technology — carbon fiber — and as you can guess, it’s also the most expensive material in the driveshaft lineup. But that doesn’t sidestep the fact that carbon fiber has the best strength-to-weight ratio of any material and is a very good dampener in and of itself. If money is no object, carbon fiber is the lightest of all driveshaft materials, meaning there’s less rotating weight under the race car. But unlike steel and aluminum, carbon fiber doesn’t stand up well to nicks and scratches. “If you’re worried about every ounce and money is no object then this is the way to go,” says Raymond. The creation of a carbon fiber driveshaft is an intriguing process that most people never get a chance to see. The manufacturing begins by “wet-winding” the carbon fiber onto steel mandrels at different angles to achieve the targeted strength characteristics. The steel or aluminum ends are then bonded into the carbon fiber tube. Dynotech does this because they still like to high-speed balance the driveshaft and need a small amount of surface area to place the balance weights. After the tube is received from their carbon fiber tube manufacturer, the ends are welded onto the application and then fit with U-joints and the slip yoke to complete the shaft. The downside to carbon fiber is twofold. First, make no mistake that it’s expensive. But secondly, it doesn’t handle damage well. As Raymond pointed out to us, an aluminum or steel driveshaft can take a scratch and be okay for use for quite some time, but any damage to a carbon fiber shaft is going to cause it to fail at the damage point sooner rather than later. What Is A Carbon Fiber-Wrapped Aluminum Driveshaft? 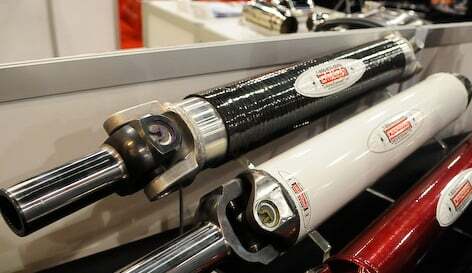 Dynotech offers a carbon fiber-wrapped driveshaft that uses the carbon as a stiffener for the standard aluminum shaft. By wrapping it with a thin layer of carbon fiber, the driveshaft can be spun about 20% faster without reaching its critical speed. The critical speed is determined by driveshaft length, diameter, and material. As Raymond points out, most of the time your best option to ensure you stay away from critical speed is by changing the diameter of the shaft to something larger in diameter. Unlike the diameter, it’s not quite as easy to change the driveshaft length. If you have three shafts (steel, aluminum, and carbon fiber) all the same length, each shaft will have its own critical speed. The driveshaft thickness is often dictated by which material you choose. This is because most driveshaft tube is manufactured to higher tolerances than any ordinary tube that you’d find at a metal supply outlet. Steel is commonly .083-inch and aluminum is 0.125-inch. According to Raymond, these are also the standard weld yokes that are available in the industry. If you’ve got a performance street car or a purpose-built race car and you’re shopping for an aftermarket driveshaft, you may be wondering what variables come into play in choosing the proper part for your vehicle and its uses. Is it based on horsepower range? On torque? On the weight of the vehicle or the intended use? These are all good questions, and as Raymond explains, it is in fact a little bit of each of these, and the experts at Dynotech are there to compile your information to help select just the right driveshaft to fit the bill. One of the keys to long life of a driveshaft is not only abiding by the rule of matching a driveshaft‘s critical speed to the application, but by installing the proper length shaft. This means meticulously measuring the vehicle as it will sit properly to ensure that the driveshaft isn’t too short or too long. The lightest driveshaft in the world means nothing if it’s laying out on the racing surface, or worse. When it comes to driveshafts for race cars, Dynotech sees a pretty good mix of both steel and aluminum being used in cars producing upwards of 900 horsepower. As Raymond pointed out to us, the most important element of selecting a driveshaft is getting it sized properly for the application. How light or how high-tech the driveshaft is is purely irrelevant if it fails during operation, and so proper measurement and fit is key. Dynotech sells more DOM steel driveshafts for racing applications than any other material, and this is primarily because it allows the customer to focus their expenses on other areas of the car or truck that can have larger effects on the on-track performance. And because it’s very strong. Speaking in terms of weight, an aluminum driveshaft is about 1.5 pounds per foot lighter than a steel-based shaft using a 3.5-inch diameter shaft, as an example. About three pounds can also be saved by going from steel ends to aluminum ends, thus making the weight difference between steel and aluminum in a 48-inch shaft about nine pounds. In terms of steel, Chromoly is estimated to be in the hundredths of a pound per square inch more than mild steel meaning the entire shaft is a fraction of a pound heavier. Carbon fiber, meanwhile, is only .18 pounds lighter per foot than aluminum, so your average 48-inch driveshaft would only save you about .63 pounds all said and done. Regardless of the material, all driveshafts use the same U-joints and slip yoke, which are the heaviest parts of a driveshaft. The point to be made here is that there isn’t as much of a difference in weight between each of the materials, and for those on a budget, that money could likely be put to better use elsewhere. In addition to proper measurement and diameter/material selection, you always want to ensure you have the proper driveline angle. An improper angle will quickly wear out the U-joints. The driveshaft in our Project BlownZ 275 Radial Camaro: a 100% chromoly steel shaft measuring 45-inches (u-joint to u-joint), with a 3.5-inch diameter. The shaft features a Spicer 1350 Series U-joint, with a 6-inch Dana Forged Steel yoke. Dynotech custom-built this driveshaft to match our combination and handle upwards of 2,000 horsepower. The primary focus of any driveshaft purchase should be strength and long-term durability, but there’s no question that weight matters to any gearhead, and said gearhead, after reading of the differences in weight between each of the materials we’ve highlighted here, probably wants to know what it all equates to on the race track. Using the common 48-inch length as an example, an aluminum driveshaft can be as much as nine pounds lighter than a mild steel or chromoly shaft. While the steel does offer more overall strength for high horsepower and torque, the lighter rotating weight of the aluminum offers better balancing properties and is less prone to bending. The laws of physics (and just pure logic) tells us that less rotating weight means less torque to rotate and therefore more energy that can be transferred on to the drive wheels, and there’s no disputing that. But as Raymond says emphatically, “I would have to bet you cannot measure the difference between aluminum and carbon fiber at the track. There are just too many variables to try and get exactly the same each time to measure that accurately.” He went on to explain that even on a chassis dyno, the differences are very minimal and often difficult to measure. The U-joints and slip yokes, which are the heaviest parts of a driveshaft, are the same between each of the materials, meaning the weight difference between each of them is primarily in the tube itself. The differences in weight between steel, aluminum, and carbon fiber are clear and present, and there’s no question that there’s some performance to be had by spending the extra cash for the lighter driveshaft. The true question is what your needs are, what you’re doing with your vehicle, and how much you have to spend. If you can gain those few hundredths of a second or few horsepower elsewhere, perhaps aluminum or even steel are the answer for you. But always keep in mind that a driveshaft means little if it’s laying out on the race track, so make matching the material, the diameter, and the proper length and angle to the vehicle and its operation (namely the critical speed) before anything else. Tech: When Size Matters. Which Diameter Driveshaft Should I Use?